Based on reviews from 14,854 users. Learn how our rankings work or see our guide to New Balance 574 sneakers. Updated Apr 2019. Digits have always been a big part of daily life, and it doesn’t matter if we like it or not; figures matter. Even in the sneaker industry, numbers count. Take the number 574 for example. With the mere mention of it, for a true sneakerhead, New Balance will always come to mind, especially the New Balance 574 shoes. It’s been lauded by both sneaker fanatics and the brand itself to be a classic sneaker, adored and treasured. The silhouette itself is such an icon that it has become a permanent style and fashion staple and fixture. Banking on this adoration, New Balance creates a collection for New Balance 574 sneakers, releasing a number of these sneakers to the delight of the sneaker community. Below, we learn about the origins of the New Balance 574 and how it shot up to fame in a matter of years. The New Balance 574 sneaker was released in 1988. It was reissued in 2003, holding the same features as the original model. The sneaker was actually made from the leftovers of an earlier model. Intended to be a running shoe, the New Balance 574 has shifted from being that to a more lifestyle and casual direction. New Balance 574 shoes carry the ENCAP cushioning system which is responsible for both protection and comfort. Due to its constant popularity, a good amount of colorways have come out for this specific model. With this sneaker, almost all the features of the original silhouette are retained, hence the “Core” in its name. It utilizes the ENCAP technology on the midsole, providing excellent stability and effective shock absorption. A unique pattern on the solid rubber outsole enhances friction. The upper of the New Balance 574 Core is made of mesh and makes the sneaker breathable. Suede overlays on the shoes make it durable. The New Balance 574 Core has been hailed to look its best with active wear. Colorways for this New Balance 574 shoes version range from bright to neutral colors. A sporty and casual style have meshed well together in the Camo model of the NB 574. The use of a camouflage print on the upper gives the sneaker a military vibe. For the upper, suede and mesh are used. The ENCAP midsole tech is also evident in this sneaker. There is New Balance branding on the heel and tongue of the New Balance 574 Camo. For good cushioning, an EVA foam midsole has been added. New Balance also offers wearers another version of the 574 Camo with neon laces. The New Balance 574 Sport has a one-piece bootie upper, giving it a modified form. Its upper has been retooled to have a fusion of suede and mesh or synthetic and mesh. Many have described the sneaker to have a minimalist vibe to it. Fresh Foam cushioning technology in the sole can be observed. Meanwhile, an EVA foam and the trademark ABZORB can be found on the heel. The tongue of this New Balance 574 shoes version is accented by the NB 574 branding. There is a nylon pull tab on the heel. Joining the New Balance 574 sneakers family is the New Balance 574 Leather which was released in July of 2015. The luxury upgrade of the main 574 model that used premium all-leather uppers and a gum rubber outsole. Padded ankle collars make for all-day comfort. There is also the ENCAP midsole tech and EVA foam. It is a unisex pair of sneakers. Singer Rihanna has been seen wearing the NB 574 Leather multiple times. For this New Balance 574 shoe version, it gets tagged as “Classic 574” because it uses mesh and suede for the upper just like the original did. The New Balance 574 Classic is a mashup of two sneakers. EVA foam midsoles keep the feet cushioned. The shoe utilizes an ENCAP midsole. Extra laces can be found with the New Balance 574 Classic. The New Balance 574 Core Plus was, initially, a sneaker offered to women. With a breathable mesh upper, the 574 Core Plus also has leather and suede overlays. A men’s edition was soon released and was offered in uppers with solid colors. It has the core ENCAP technology. Long-lasting rubber outsoles have been added to the low top. This New Balance 574 sneakers version of the OG get a minimalist feel to it with some elements being stripped off. It is lightweight and less bulky. Taking the place of the ENCAP technology for this sneaker is the Fresh Foam, a design that has different zonal support for stability and impact protection. The New Balance 574 Fresh Foam is perfect for light running and for daily wear. The NB 574 Retro Sport joined the New Balance 574 sneakers family in the summer of 2017. It holds the traditional look of the original sneaker. The Retro Sport low top is inspired by the 1980s hip fashion. It has simple contrasting color variants to it. The upper of this low top sneaker is made of air permeating mesh and had premium suede overlays. Keeping up with the modern age, New Balance adds to the New Balance 574 shoes collection the New Balance 574 Re-Engineered. It has an all mesh upper with ENCAP soles. This sneaker is a face-lifted version of the original. It is a slimmer and sleeker 574 in looks. It is much more breathable and lighter. The TPU that can be found in the Re-Engineered’s heel adds support and stability. The New Balance 574 Outdoor Escape has been mainly designed to keep the feet dry and warm while being outdoors. For better traction on a good number of surfaces is a rugged outsole. The ENCAP midsole technology is also on this iteration. For the men’s version, the upper is made of suede while the women’s version has heathered knit for the top. The New Balance 574 Lux has a timeless and clean design and look to it. Its upper is made of a nice and smooth Nubuck leather. A mesh tongue makes it breathable and has a terry cloth lining. Removable insoles let the wearer replace it with whatever orthotics they wish to put in. The New Balance 574 Retro Surf is inspired by the chill vibes of the beach. The ENCAP technology is also maintained in this sneaker. The collar and tongue are padded. The contrasting colors on the tongue and heel counter are done for visual purposes. For a polished look, the New Balance 574 Reflective has a suede and mesh upper. This Reflective 574 edition comes with glitter on the iconic “N” logo found on the heel tab and sides. This sneaker is made for the outdoors. A soft cushioned EVA paired with a nice and sturdy PU rim makes for very comfy wear. The New Balance 574 Canvas Waxed joins the New Balance 574 sneakers collection to rave reviews. It’s been lauded to be a retro-inspired lifestyle shoe, modern and laid-back at the same time. The sneaker has a durable canvas waxed upper. Cushioned EVA midsoles offer comfort. The New Balance 574 Molten Metal was launched in fall of 2016, a welcome addition to the New Balance 574 sneakers family. It has a metallic and shiny glitter on the outsole with contrasting gold on the heel tab of the sneaker. The upper is made up of a synthetic and monochromatic upper. The sneaker comes in three different colorways, mainly supernova, black, and gunmetal. Adding color packs to the New Balance 574 sneakers collection is the 574 Urban Twilight. The sneaker has a casual and sporty appeal to it. Bold and shimmery colors on the heel, the tongue, and the N logo is the inspiration behind the name. Pig suede and mesh make up the upper of the low top. The colors are inspired by the sight and sounds of the cityscape during twilight. The ENCAP tech on this particular 574 is combined with PU material and a soft core EVA. With the New Balance 574 Fresh Foam Polka Dot, it is clearly a revamp of the 574 Fresh Foam. It’s a modern take of New Balance 574 shoes, with infused layers that has matching white dots all over. This iteration is made for men. The Fresh Foam midsole has hexagonal accents to it. Heat-bonded treatment is how the polka dots are added. Poly-suede sockliners make for a cozy feel. This New Balance 574 sneakers variation exudes fun and liveliness with its colorways. New Balances has added a tweed tongue and a marbled heel tab to this iteration. For maximum breathability, a durable textile upper material is used with a reinforced toe area. It is available exclusively in sizes for women. This sneaker also comes in another name; the New Balance WL574-MP. Adding to the New Balance 574 sneakers that cater to women is the 574 Miami Palms. The sneaker was released in 2017. The vibrant colors are inspired by Miami’s tropical setting. It stays true to its heritage with the suede and mesh upper. The suede and mesh upper paired with a traditional lace-up closure system give the OG a flexible and secure fit. A narrow heel with a high instep and a wide forefoot with a deep toe box should be taken note of. Men’s sizes: 6.5 to 17 US. Medium to wide widths. Women’s sizes: 5 to 12 US. Medium to wide widths. The fit of the sneaker can be customized with the lacing system that it holds. Men’s sizes: 6.5 to 18 US. Wide width. Women’s sizes: 5 to 12 US. Wide width. The 574 Camo generally has the same fit as most New Balance 574 sneakers. Men’s sizes: 7 to 13 US. Medium width. Women’s sizes: 5 to 12 US. Medium width. With a one-piece bootie, the New Balance 574 Sport runs large. It runs tight and narrow. Men’s sizes: 4 to 13 US. Standard width. Going half a size down is advised. A traditional lace closure lets the wearer have an adjustable fit. Men’s sizes: 7 to 15 US. D standard width, and 2E wide widths. Women’s sizes: 5.5 to 12 US. B standard width. It is also available in kids’ sizes. The lacing gives the Classic a snug fit. Men’s sizes: 6.5 to 18 US. Standard and wide widths. Women’s sizes: 5 to 12 US. Medium and wide widths. Wearers with broad feet need to go a full size higher than usual. Narrow-footed sneakerheads should get half a size higher. Men’s sizes: 7.5 to 16 US. Medium width. Women’s sizes: 5 to 12 US. Standard width. The fitting is made well and snug with a secure lacing system. Men’s sizes: 6 to 12 US. Medium width. Amongst the New Balance 574 sneakers, the Retro Sport is one sneaker that runs narrow. Men’s sizes: 4 to 16 US. Medium width. Slender footed wearers should go half a size higher. Wide-footed sneakerheads are advised to go a full size up. The pair has been said to run true to its size generally. Men’s sizes: 4 to 14 US. Medium width. Like most New Balance 574 sneakers, the Outdoor Escape has been lauded to fit on a true to size basis. Men’s sizes: 6 to 18 US. Standard and wide widths. Women’s sizes: 5 to 12 US. Standard and wide widths. The soft Nubuck leather upper and the mesh tongue gives the wearer a comfortable fit. Men’s sizes: 5 to 18 US. 2E to D widths. Women’s sizes: 5 to 12 US. 2E to D widths. The 574 Retro Surf usually runs true to size. Men’s sizes: 4.5 to 18 US. Medium and wide widths. For a flexible fit, the suede and mesh upper make the 574 Reflective perfect for it. The sneaker runs true to size most of the time. The canvas waxed upper gives good support. With length and width, the shoe runs true to it. Men’s sizes: 6.5 to 18 US. Medium width. The kicks support the ankle and foot very well. The New Balance 574 Molten Metal runs true to size. Women’s sizes: 5 to 11 US. Medium width. Wide-footed people are advised to try half a size larger of the sneakers. For this pair of New Balance 574 sneakers, NB has made sure to stick to it fits true to size, as with most of the other models in the New Balance 574 sneakers collection. Men’s sizes: 7 to 18 US. D and E widths. Women’s sizes: 5 to 11 US. B width. The Fresh Foam midsole gives a plush feel and makes the wearer have a comfy fit when wearing the Fresh Foam Polka Dot. Men’s sizes: 7 to 10 US. D medium width. The New Balance 574 Art School runs true to size. For a secure fit, the sneaker has laces. The fit for this sneaker has been observed to be narrow for some but for most, runs true to size. Women’s sizes: 5 to 12 US. When was the New Balance 574 created? The first-ever New Balance 574 sneaker was created in the year 1988. It was an advanced running shoe that had a distinct design to it. So why has it come back? Is there a specific reason for its return? New Balance 574 sneakers are back in full swing after its initial reissue which was done in 2003. People were loving the old kicks so much, there was a clamor to own a pair which prompted New Balance to give in and bring back the classics. Are New Balance 574 sneakers made and built for men or women? The New Balance 574 shoes are, really, for everyone. In today’s world, brands are very inclusive. Some variations of the model come in men’s and women’s sizes, while other New Balance 574 sneakers are made to be exclusive for either men or women. It won’t matter as much though as there is always the choice to convert sizes to get a pair in either men’s sizes for women, and women’s sizes for men. How do we keep the New Balance 574 clean? Always use a soft bristled brush with a mild detergent. Remember, use a detergent that is free of dye to avoid any staining. Scrub the dirty parts of the sneaker with brush and the solution. Use a damp cloth to wipe clean. Air dry sneakers for at least 24 hours. Put out in the sun to dry. Use a washing machine to clean it. Use a dryer to dry it. Why is the New Balance 574 considered a classic? The New Balance 574 is considered a classic as the 574 is the epitome of what an iconic New Balance design is and should be. It’s been around since the 80s and has been capturing the attention and hearts of fans old and young for years now. What can be paired with the New Balance 574 shoes? Where can one get a pair of New Balance 574s? New Balance 574 sneakers are widely available all over the globe. Walking into a New Balance store or even a sneaker shop, one will most likely find one on display or in stock. For those who do not have the time to visit a store and would instead buy and shop conveniently from home can purchase the sneakers online. How does one differentiate fake/counterfeit sneakers from real New Balance 574 sneakers? 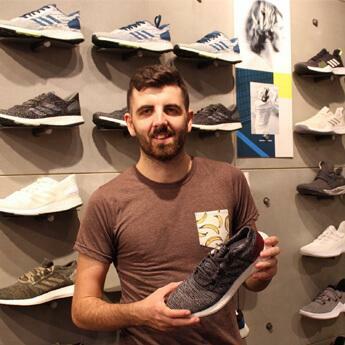 It’s pretty simple to catch a counterfeit sneaker; all one needs is a keen eye. With a quick comparison to an original New Balance 574 sneaker, the imitations won’t be hard to miss. It’s all a matter of where to look for the discrepancies. Usually, these can be found on the logos and the tags, as well as the detailing. 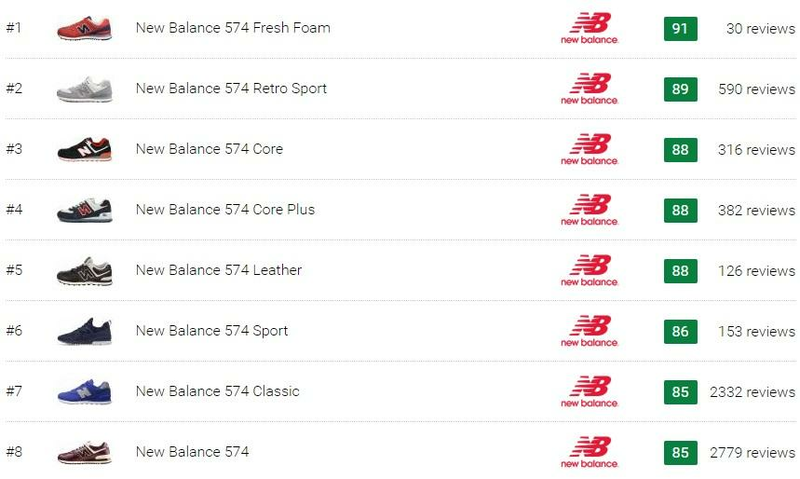 What is the price range of New Balance 574 shoes? New Balance 574 sneakers can run for as low as $80 for a pair of reissued OGs to as high as $190 for collaborated pairs and rare ones. What do the numbers to a New Balance sneaker mean?